Orfeo ed Euridice was the first of Christoph Willibald Gluck's three 'reform' operas in which all the elements of musical theatre - music, singing and ballet - were fully integrated. The 'noble simplicity' in the action and music was intended to replace the complicated plot and florid and flowery musical style of Italian opera seria and of French tragédie lyrique. As compared to Alceste and Paride ed Elena, the two other operas of Gluck's 'revolution', Orfeo ed Euridice requires a small orchestral ensemble, three singers, a chorus and only a few dancers. Hence, it is comparatively easy, and not very costly, to stage. As discussed on 14 June 2014 - read 'Orpheus versus Orpheus' - the issue is which version to choose. There are two main versions. A 1762 Orfeo ed Euridice had its debut in Vienna and has a libretto in Italian by the well-known poet Ranieri de' Calzabigi; then there is a 1774 Orphée et Eurydice, in French, adapted by the composer and by young French poet Pierre-Louis Moline, to better suit the Parisian taste, albeit keeping the fundamentals of the 'reform'. To make things more complicated, in the nineteenth century, Orphée et Eurydice was the only often-performed seventeenth century opera. This was not the 1774 version but a new edition for large orchestra, adapted by Hector Berlioz. Finally, when Ricordi published the 'definitive' version in 1889, the product was an interpolation of Berlioz's work with Gluck's 1762 and 1774 versions and the addition of arias from yet other operas of the Bohemian composer. A real mess! Critical editions have been produced only recently. 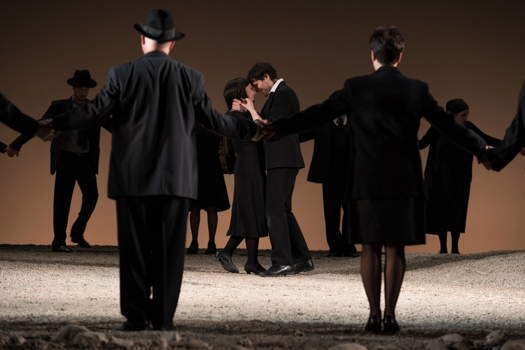 Yet the Gluck-Berlioz Orphée et Eurydice was staged in Marseilles in a production which reached Palermo in 2015 and which I reviewed on 26 February 2015 - read 'Skillfully Adapted'. In practice, the French 1774 version of the Gluck-Berlioz product is performed in theatres more often than the original 1762 version, which is, however, very frequently presented in concert versions. The later Orphée et Eurydice is somewhat longer than the eighty-minute Orfeo ed Euridice; consequently, rightly or wrongly, it is deemed more appropriate to fill an evening. 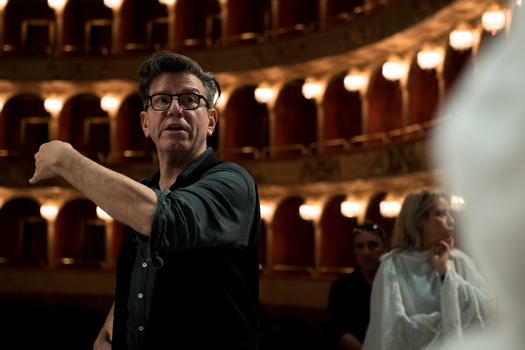 A concert version of the original Orfeo ed Euridice was performed in Rome by Accademia Filarmonica Romana some thirty years ago, but Teatro dell'Opera's latest staged production, a blend of the various versions, took place in 1968. Thus, on 15 March 2019, the opening night of the 1762 version was nearly a debut. The production is a joint venture between Teatro dell'Opera di Roma, Paris' Théâtre des Champs Elysées, Château de Versailles Spectacles and the Canadian Opera Company. The stage director is the Canadian Robert Carsen; sets and costumes are by Tobias Hoheisel; lighting (a key aspect of this staging) is by Peter Van Praet and Robert Carsen himself. We are not in a lush Thrace, as often depicted in operas, ballets and plays on the Orpheus myth, but in an arid dry land in a timeless setting. In this dry place, the peasants - in twentieth century attire - dig Eurydice's tomb. Without intermission, the lighting transforms the dry land into the afterworld, where the dead wear white sheets. Again, the lighting brings the audience back to the arid countryside. The chorus, led by Roberto Gabbiani, is, as usual, magnificent, both vocally and acting. They are often silhouettes like in early twentieth century movies. 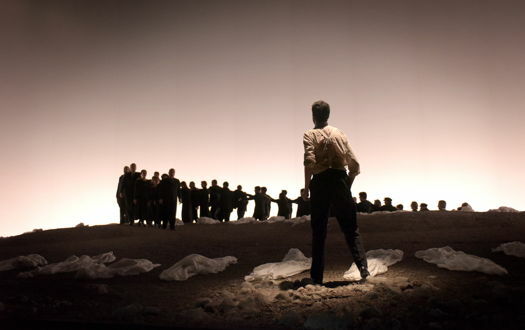 The real coups de théâtre are conductor Gianluca Capuano and Carlo Vistoli as Orfeo. Capuano is Cecilia Bartoli's young favorite conductor; I have often reported on him from the Salzburg Festival. He has the perfect touch for Gluck's Orfeo ed Euridice. He makes no concession to baroque flair as, for instance, John Eliot Gardiner does in a famous recording of the opera, but is terse and full of dramatic tension (with, of course, exceptions in the introduction and at the happy ending, as required by the ceremonial debut at the Austrian court on the occasion of a wedding). He also gives the appropriate 'start' to the singers. He molds the score as a very modern composition - now and in 1762. The role of Orpheus was written for a castrato following the custom at the time. It is frequently entrusted to an alto or to a lyric tenor or even worse to a baritone, by lowering the register by three octaves. Carlo Vistoli is a young and attractive countertenor and an excellent actor. He carries most of the load of the performance, not solely in the three well-known arias but in the impervious recitatives sliding into declamation and arioso. Eurydice is a sensual Mariangela Sicilia, and Amore a very good Emőke Baráth. The performance was followed by ten minutes of applause for all, and ovations for Carlo Vistoli.